Following Turkey's two-month long invasion of Northern Syria and subsequent takeover of the predominantly Kurdish town of Afrin, the logical question that remains is: what 's next for the 'Mad Sultan' Erdogan? 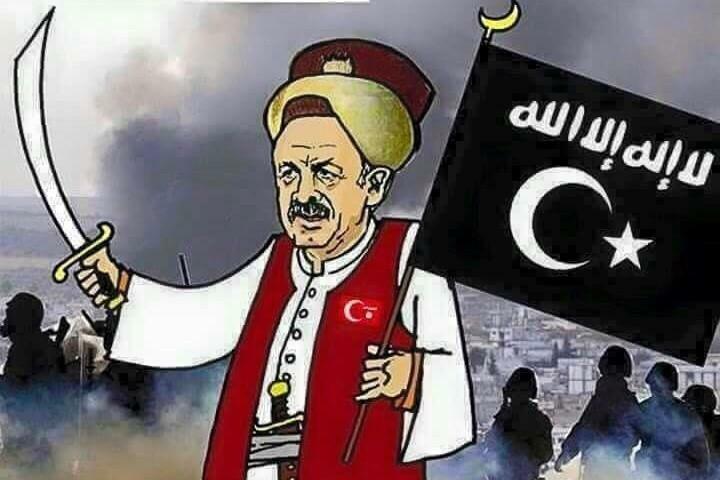 President Recep Tayyip Erdogan's Sunday victory speech didn't lack for the usually robust symbolism denoting neo-Ottoman aspirations far beyond the borders of Turkey (Erdogan gleefully exclaimed, "Now the Turkish flag will fly over there! The flag of the Free Syrian Army will fly over there!" - while comparing the Afrin campaign to the Ottoman defense of Gallipoli during World War I at a ceremony marking the WWI allied powers assault to open the Dardanelles). And true to form the Turkish president on the following day promised further "extensions" of his forces in the region, including into Eastern Syria and Iraq. As reported by the Turkish daily Hurriyet, Erdogan pledged to expand east into Syrian Kurdish YPG territory (Kurdish "People's Protection Units" which Turkey considers an extension of the terrorist PKK), which would pit his forces (including his Free Syrian Army/FSA ground proxies) against the US armed and trained Syrian Democratic Forces (SDF). “We have completed an important stage of ‘Operation Olive Branch’ by taking control of the city center of Afrin. We will continue this process until we have entirely abolished the corridor through Manbij, Ayn al-Arab, Tel-Abyad, Ras al-Ayn and Qamishli." Likely, this is merely more of 'Sultan' Erdogan's empty chest thumping for the sake of his political base which has been nothing new throughout the Syrian war; however, the fact remains that Afrin represents two enormous geopolitical victories for Turkey, namely: 1) the Pentagon was quick to throw the YPG in Afrin under the bus (to cover its tracks, the Pentagon has attempted to make a linguistic distinction between the YPG per se and the Syrian Democratic Forces - the former comprises the bulk of the latter - as well as a distinction between YPG operating in Afrin Canton and the rest of Kurdish forces in Rojava), and 2) Russia opened Syrian airspace over Afrin canton and Idlib in a move without which the Turkish aerial campaign would have been impossible. This follows previous talks in past months with the Baghdad government over possible Turkish-Iraqi cooperation regarding rooting out PKK militants from the area of Sinjar in Iraq's north, however, Iraq is unlikely to respond possibly to threats of Turkey's army "suddenly entering Sinjar one night...". Regarding Afrin, Erdogan indicated that Turkish forces would eventually retreat once "terrorists" were rooted out, leaving the city and area to its “real owners" - a continuation on his previously openly expressed goal of radical demographic shift in northwest Syria based on claimed ethnic statistics. It was during a televised speech in late January upon the launch of 'Operation Olive Branch' wherein Erdogan first vowed "to give Afrin back to its real owners." He stated at the time that "55% of Afrin is composed of Arabs with %35 of Kurds coming there later on" - with the implication that Turkey's military campaign would drastically reduce the predominantly Kurdish population back down below Erdogan's proposed demographic numbers. For this reason, Syrian Kurdish media has consistently accused Turkey of launching the campaign out of a desire to ethnically cleanse the Turkish border region of its historically Kurdish identity. Indeed Erdogan's own words during televised speeches clearly reveal military aims that fit the textbook definition of genocide, to say nothing of the actual atrocities that have been ongoing on the ground.